I am not a big reader. I wish I was, but sadly, I never have been. I like to read magazines, but I think I really spend more time looking at the pictures then actually reading the articles. I remember when I was a child, I was told I was going to have to read a lot when I went to college. I was shocked and saddened because I dislike reading so much. This year I have actually finished a few books. Depending on your interests, you may or may not find them "inspiring" but they were for me. I read the above two books this year. I chose to read each book for different reasons. 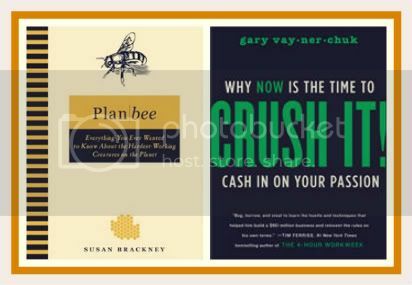 I picked the first one, Plan Bee by Susan Brackney because I became a beekeeper this year, and I wanted to learn as much as possible about this hobby. Plan Bee was a very informative read. It covered the history of bees, it also helped explain the dynamic in the hive with the three different bees, the Queen, Drones, and Worker Bees. ..And it also touched on Colony Collapse Disorder (CCD) - the alarming disappearance of honey bees. There is so much to know about beekeeping. I went to beekeeping school, but this book helped fill in the cracks with other things I really needed to know about this hobby. The second book, Crush It, by Gary Vaynerchuk came about from my obsession with sewing and my interest in starting an Etsy shop for all the stuff I was making. His book doesn't highlight specific tips on selling on Etsy, but it does tell you in great detail, how to cash in on your passions. I think Crush It is a book a lot of people can benefit from. So many people go through life working jobs they hate. That is so sad., especially because so many of your waking hours are spent at work. The idea is to figure out what you LOVE to do, and then find a way to make money doing it. Then it's not "WORK". It's not a "JOB", it's fun which results in a better quality of life for you and ultimately, in the end lots of Happiness. Is that what we all want? If either of these books sound of interest to you, click on the links below to read more about them. 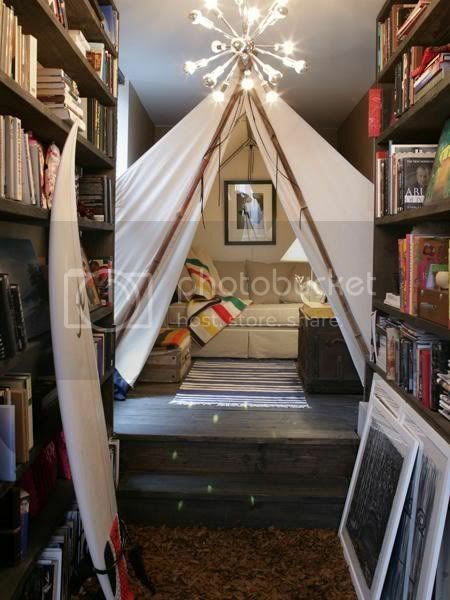 ...One more thing, even though I don't love to read, I think it would be fabulous to have a little home library/reading nook like this someday. It looks so cozy. Maybe I would start to like to read if I had something like this. Love this! New follower from FTLOB!! Stopping by via FTLOB and so glad I did! I love your blog, it's so creative. Thse books look great! Thank you for sharing. Stopping by from FTLOBs! Stopping by from FTLOB too love your blog!